The players are on the ice rink are ready to do battle with the opponent team. Both sides have donned their respective jerseys (white and yellow); and protective gear such as helmets, kneecaps, and shoulder pads. Some players are sporting war paint so that the opponent knows that they mean business (or cracking body parts).The referee in a striped shirt and black pants skates on to the center of the rink and places the puck. The two forwards lock their sticks over the puck. The referee blows his whistle and the game is go. The yellow team center picks the puck up and passes it to the left-winger. The left-winger dodges his opponent and passes it back to the center. The right defenseman from the white team tries to intercept the yellow team center but fails. With a clear shot on goal, the center shoots the puck. A despairing dive from the goaltender is in vain, as the puck finds the back of the net. The yellow team scores and is one goal up over their opponents. 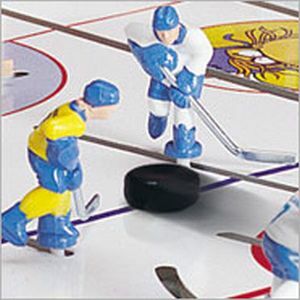 This might seem like a normal game of ice hockey; the only difference is that it takes place on a foosball-sized table and human hands guide the players. Welcome to the world of ‘Play Off Ice Hockey’: Ice Hockey’s answer to soccer’s foosball table. 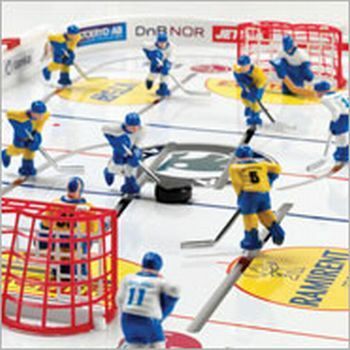 Ice Hockey fans would be pleased as punch when they see that their favorite sport has been brought alive on a miniature scale. The attention to detail paid by the design team of ‘Play Off Ice Hockey’ needs to be applauded. The entire rink has been recreated on a simulation table replete with protective Plexiglas boards. The simulation hockey table has been neatly divided into the center zone and end zones with the appropriate red and blue color lines. A colorful Skoda Auto logo decorates the center faceoff circle with logos of other popular brands imprinted on the rest of the table. Hockey players on the board move along vertical and horizontal grooves. Six handling bars are placed on either end and allow users total control over their players. 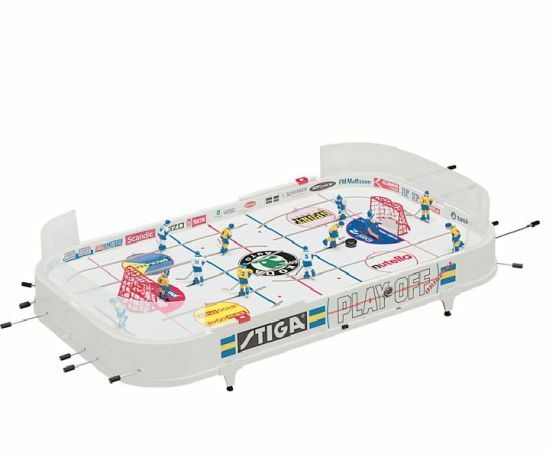 Unlike the foosball table where users simply rotate and pull the handle bars at top speed, the ice hockey table needs more finesse and skill on the part of the user to control their team. Play Off Ice Hockey brings the fast and furious game to your living room and is a must have if you live and breathe ice hockey. One can own this game at the price of £59.99 only. If situations don’t permit you to move out of your homes or offices, get Lego Foosball Table or Gold Lux Foosball Table and enjoy great gaming!